'One Macquarie'... A Stunning Statement in First Class Riverfront Living!! Privately positioned in Teneriffe's exclusive "One Macquarie", this 357 square metre apartment in a boutique complex offers all the lifestyle of a 5-star luxury hotel. Liveability and space combine with a perfect north-east aspect to create the ultimate riverfront apartment with ''Picture Perfect Views''. This apartment features a versatile layout that will easily adjust to suit your every need while providing space in which to live, dine, relax and entertain in consummate style. Vast living and dining spaces effortlessly merge together before spanning out to a relaxed entertaining balcony with impressive built-in BBQ. Enjoy a glass of wine while taking in the vibrant river life. An oversized media room/executive study provides additional space and privacy. Sophisticated yet comfortable interiors blend quality materials with the finest in finishes including hardwood solid timber flooring, neutral tones with chic accenting details and floor-to-ceiling tinted glass to maintain that constant visual connection with the stunning riverfront views. The designer kitchen offers wide stone benches, extensive storage and a full range of Miele stainless steel appliances. The impressive master suite features his and hers walk-in robe and luxurious ensuite with marble benchtops and freestanding bath. Two additional bedrooms, all large and airy, offer space to move and are serviced by a stylish main bathroom and powder room. A plethora of additional features ensure ease of living with ultimate comfort at the touch of a button. 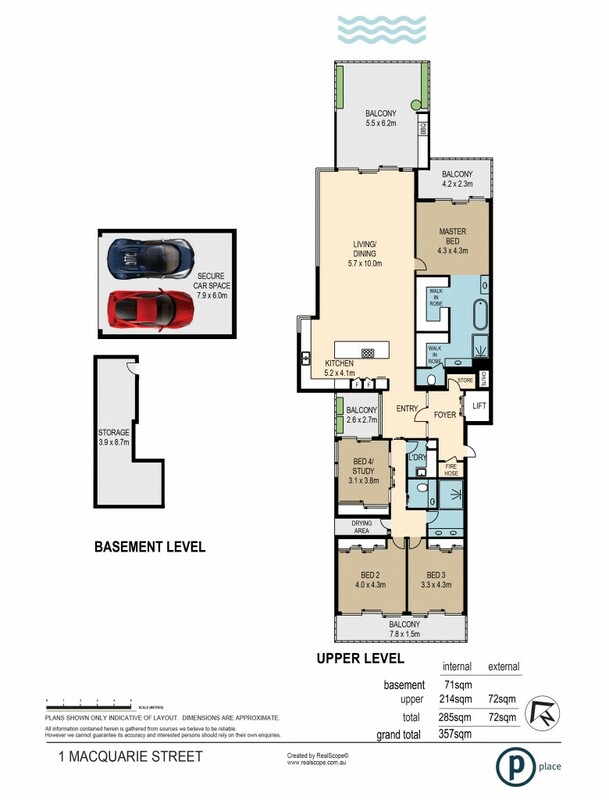 This includes audio/visual intercom, ducted air conditioning and direct lift access from your secure two car basement garage along with an additional storage room. Positioned in the prestigious "One Macquarie" complex, this is an opportunity to live that enviable inner city lifestyle that so many aspire to. Resort-style amenities, available to residents only, ensure the best in comfort and convenience. This includes a well-equipped gym, concierge service and both a lap and relaxation pool surrounded by private established gardens. There is also secure guest car parking available. This popular complex is pet friendly. Beyond this cocoon of luxury are all the attractions of the fashionable vibrancy of Teneriffe and New Farm. The riverwalks, popular James Street Markets, New Farm Park, a wide selection of restaurants and eateries and high end fashion boutiques are at your doorstep. Brisbane's CBD is two kilometres away. "One Macquarie" is set apart by its quiet elegance, uncompromising quality and cutting edge design. It offers a privileged lifestyle today and the promise of a blue-chip investment for the future.